Anamudi Peak is 15 km from Shire Hostel, while Eravikulam National Park is 19 km from the property. 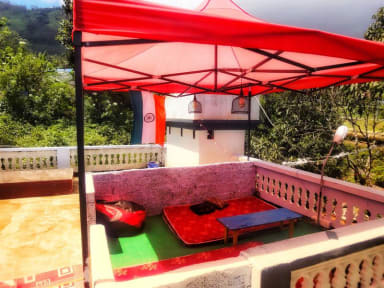 Set in Munnar, 6 km from Munnar Tea Museum and 11 km from Mattupetty Dam, Shire Hostel features mountain views and free WiFi. The bed and breakfast provides guests with a terrace, garden views, a seating area, a TV, a fully equipped kitchen with a dishwasher, and a shared bathroom with shower. A toaster and kettle are also featured. This hostel has a bathroom with a bath and free toiletries. A flat-screen TV is offered. Featuring mountain views, SHIRE HOSTEL provides accommodation with a balcony, around 6 km from Munnar Tea Museum. This homestay offers room service and free WiFi. This homestay has a bathroom with a bath and free toiletries. A flat-screen TV is offered. 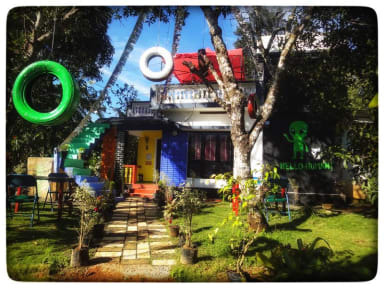 One of the most amazing places you can stay in Munnar for the cost! The hospitality that you get there wouldn't be matched anywhere ! Great job guys!! It is a great hostel because the guys that work together are fantastic. However it is not clean and the layout is fairly odd. You often have to walk through peoples bedrooms to get to a bashroom. HOWEVER, all these negatives seem to bring people together. I met great people and it’s small enough that you get to know everyone. They’re food is not great. Go into the nearest turn we’re youll be treated to amazing food for peanuts. I’d stay again. A bit chaotic hostel that gets overbooked all the time and people are moved to a private guesthouse nearby. The rooms are cramped up and the location is pretty remote. But overall the experience is good, the staff is very friendly and helpful, the breakfast is good and the atmosphere is perfect. The small places make everyone come together and gives the hostel a cosy feel to it. Come for the incredible setting. Stay for the cool people you’ll meet there. Prepare to deal with a degree of chaos. I give The Shire the benefit of doubt. The atmosphere is amazing, staff is welcoming, but I dare you to find a more chaotic hostel. They relocated me to a homestay up hill, owned by friends, while I actually made a reservation. They mess up bookings. Constantly move you from one bed to the other (hint: keep your stuff everywhere, if you leave your bed clean you might lose it). Fail to change sheets. Etc... Cool place to say for a couple of nights, but you'll likely get ptsd. Sometimes people arrive at hostels without beds; once in awhile, it happens. Here however I saw 4 separate groups with reservations not have beds on arrival - there is no doubt that it isn’t some way intentional money grubbing. Very social and chaotic - is probably worth the risk if you’re willing to roll with it. We were warned on the disorganised nature of this hostel but booked anyway based on atmosphere. The staff are nice but will always say yes to guests extending their stay which means new guests are often moved into the guesthouse, Drizzle Cottages, across the road as we were. This was actually lovely and we can’t complain but it isn’t what we booked or expected. I didn’t even get to stay at the hostel, the staff let other travellers stay longer and had us stay elsewhere.. they let anyone extend their stay, even if they are suppose to be full that night. So you never actually know if there is going to be room for you. hostel was overbooked. they took us to a neighboring facility without mentioning the problem and just dropped us off without explaining this to us or the new hotel. there was often no one at the hostel to help. kitchen was dirty and you had to walk through all the bunks to get to the bathroom. hard location to get into and out of. As per several other reviews, when I arrived, they did not have a room available for me. Instead of being put in the cottages right across the street (as many other guests are), they put me in a rickshaw and drove me 5km up the road to a completely different homestay. They were very pushy about it and didn’t want to answer my questions. They didn’t check my passport (like all hostels should) or even have me check in for that matter. I never saw the hostel or staff again during my stay.